The UK Professional Standards Framework is a comprehensive set of professional standards and guidelines for everyone involved in teaching and supporting learning in HE. It can be applied to personal development programmes at individual or institutional level to improve teaching quality. We recommend all staff engage with the dimensions of the UKPSF as part of their academic practice and apply for the appropriate level of fellowship of the Higher Education Academy, an award demonstrating relevant adherence to the UKPSF. To find out more, see our UKPSF page. All academic staff, other than hourly paid, involved in teaching are expected to engage in the University's Observation of Teaching Policy. However, anyone involved in teaching at the University is encouraged to engage in observation of teaching. To find out more about, please see the Observation of Teaching page. Your role as an academic at the University of Salford will likely involve a range of practice across the design, delivery and assessment of your students learning. The information below is intended to highlight University recommended practice as well as signposting key policies and guideance from across the University relating your teaching practice. Physical learning spaces can take many forms at the University of Salford, from lecture theatres to informal learning zones, seminar rooms to industry collaboration zones. When considering how to engage your students in the face to face environment, we highly recommend, and regularly use in our development sessions, the JISC Viewpoints Learner Engagement toolkit. Traditionally, seminars involve group discussion of material presented either in a lecture or in set reading. The prupose of this is to develop student skills in working with others and in orally presenting material to help them take a full and active part in thier learning. Seminar sessions are become more developed in their approach to learning, with a range of active learning practices and often a 'flipped classroom' model used. The underlying principles of inverted teaching, or the 'flipped classroom' as it is more commonly known, are not new. If you have ever asked students to read an article or view a resource in their own time in order to prepare for an active learning session in the physical learning space, then you have flipped your classroom. However, the growth of online multimedia use in higher education has led to a deeper exploration of this practice and the development of a number of models of implementation. Facilitate a flexible environment, both physically in that students can be active, and in regards to the expectations of students to allow students to learn at their own pace and in a format relevant to their own personal context. Drive a shift in the learning culture of the classroom to a student centred approach. Generate or source intentional content to clearly address direct instruction outside of the classroom. Be a professional educator, taking a less visibly prominent role than a traditional lecturer, and instead being a highly observant, critical and reflective facilitator of learning. Active learning is learning which engages and challenges children and young people’s thinking using real-life and imaginary situations. It takes full advantage of the opportunities for learning presented by: spontaneous play; planned, purposeful play; investigating and exploring; events and life experiences; focused learning and teaching. All active learning opportunities can be supported when necessary through sensitive intervention to support or extend learning. Group work involves many skills of listening, questioning, responding and explaining, for both teachers and students. Crucial to these for the teacher is leadership. Here important things to remember are flexibility and focus. It is important to keep to the focus of the topic, but if the group wants to discuss something relevant but which you have not prepared try to fit it in and take something else out. Sparking off ideas is usually appreciated but dominating the discussion is not. Try hard not to fall back onto the position of expert, authority and prime talker. It's useful here to think about the research on what students don't like. Pre-eminent here are being made to contribute when you don't want to; being interrogated; being asked vague questions; having your view summarily shot down; tutors appearing bored. Conversely, being genuinely enthusiastic in the topic is regarded as a real plus. Virtual learning spaces are quickly becoming synonymous with physical learning spaces, with opportunities for communication, interaction and collaboration providing a growing wealth of teaching opportunities. If you are considering designing a new online programmer, or developing an existing programmer for online delivery, we would highly recommended discussing this with an Academic Developer from the QEO. You may find the following models, frameworks and resources useful when designing, delivering and evaluating online programmes of study. 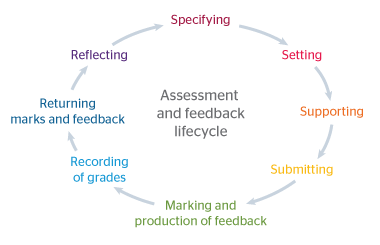 Formative assessment is the formal or informal procedure of assessing a students understanding during the learning journey to inform and modify teaching and learning activities. Assessment and Learning: differences and relationships between formative and summative assessment. Summative assessment is the process by which we evaluate student learning and academic achievement at the conclusion of a defined period — typically at the end of a project or module. The following guidance and signposted documents and policies have been broken down into the key activities you as an academic will engage with when summatively assessing students. Assessment and Learning: differences and relationships between formative and summative assessment. An authentic task is a problem task that confronts students with activities that are also carried out in professional practice. The fact that an authentic task is crucial for an authentic assessment is undisputed (Herrington & Herrington, 1998; Newmann, 1997; Wiggins, 1993), but different researchers stress different elements of an authentic task.